Roland Emmerich is famous for directing disaster movies, like 2012 and INDEPENDENCE DAY. 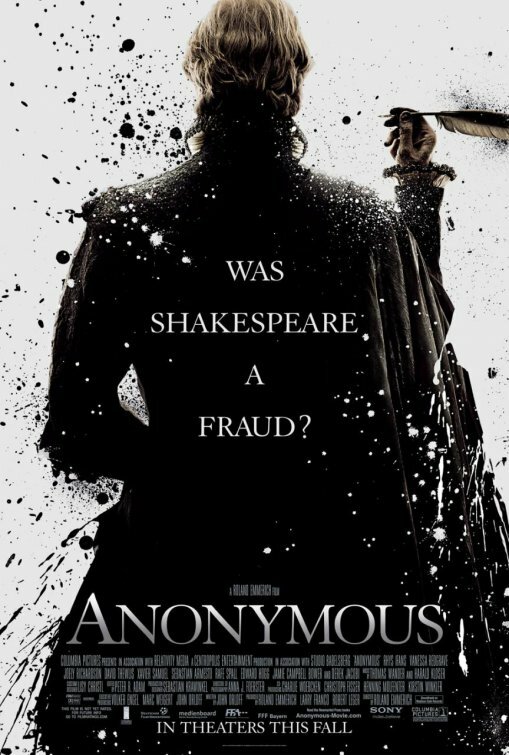 His latest, ANONYMOUS, is supposed to be a grand departure but it still felt an awful lot like a disaster to me. 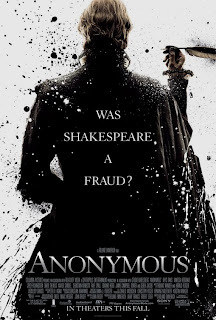 And what better way to distance yourself from a genre that practically ignores story completely, than to take on a story that attacks the character of one of the most famed storytellers of all time, William Shakespeare. Rhys Ifans stars as Edward De Vere, the 17th Earl of Oxford and, according to Emmerich, the actual writer of Shakespeare’s plays. It’s an interesting theory but one that Emmerich executes with about as much finesse and subtlety as one would expect from the man who rewrote history in 10,000 B.C. If I were Emmerich, I would have left my name off of this one. I don’t know why but I had expected this one to be good. Perhaps getting false expectations since the last Shakespeare movie I watched was lovel (Shakespeare in Love). I do know people who enjoyed this film. I was just not buying any of it and thought it was terribly melodramatic. This is definitely no Shakespeare in Love. In fact, I think how real that film felt at times may have made me notice how false this one was. was kind of interested in this one because of the subject matter, but knowing that mr. emmerich was involved, i was a little afraid it might be a big stinking pile of crapola. I’m disappointed that you didn’t like Anonymous. Without getting into a debate about the authorship issue (which I’ve been doing 24/7 this week), I just want to say that I disagree with you about the film in a range of 200 to 1000 percent. I think the Prince Tudor scenario is very plausible, even though it is currently a minority point of view, even within the Oxfordian camp (I don’t fully buy into it, myself). I do think there is quite a bit of evidence for Oxford’s authorship, however, and I think he will eventually be recognized as the author of the Shakespeare canon, even by the entrenched academic orthodoxy. I do respect your view but I don’t think that simply dismissing a film because it has a viewpoint that is currently not accerted by the majority is not useful. The question of Shakespeare’s authorship is a serious and complex subject that really requires considerable research to discover the evidence. I saw the film again yesterday and I loved it even more. The drama is compelling and the acting uniformly superb, the film effects stunning and the story telling quality of the script wonderful. I highly recommend this film both for its historic relevance and for its sheer beauty. Thank you, Howard, for that fantastic insight. To be fair, I did not say that the theory itself was ridiculous or unbelievable; I claimed that Emmerich doesn’t do a good job convincing me of its potential. From what I read in my research, because I too was quite intrigued by the idea behind this film, much of what Emmerich demonstrates in the film could also be simply exaggerated gossip from the period. All in all, I believe a much more talented filmmaker, or at least one better suited to this story, could have made a better case.